They were filming a minor "Leverage" scene in Waterfront Park this morning, so I stopped and rubbernecked a little and grabbed a few pictures. 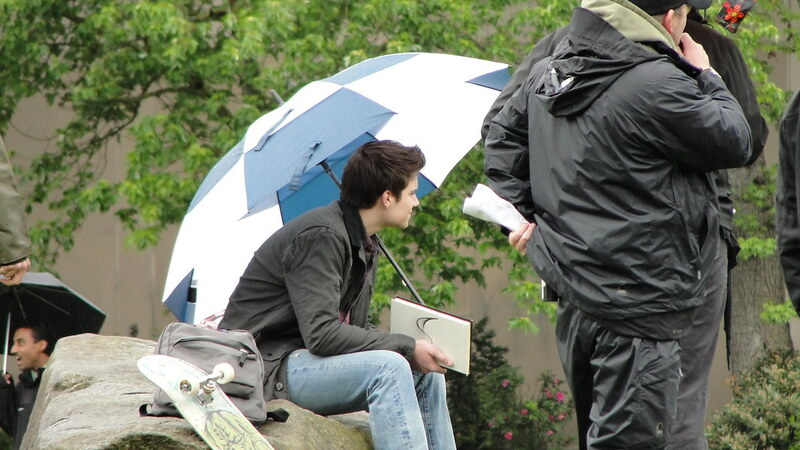 The two young actors (playing high-schoolers, judging from the skateboard prop) were in spring clothes, while you can see from the bundled-up crew that it was a chilly, damp morning. I don't recognize either of them, but they're both very pretty. The girl was dancing to keep warm. Just for fun, here's a reference shot. You can just make out the blue-and-white umbrella over the young actor in the center. Everyone else is running around setting things up and presumably keeping warm. There were at least as many people not in the shot, huddling in marquees, talking on phones, moving equipment about and looking busy. These are all well-paid and mostly union jobs, and the Leverage production company uses almost entirely local talent except for the main actors and the directors, so that right there is money flowing from Hollywood to Stumptown. I tried to spot any actor, producer, or director I recognized, but no luck. Woot woot Leverage! Did they just start shooting again or have they been for awhile? I'm assuming they must've been back for awhile, because I've been seeing ads for the new season starting on 6/20. 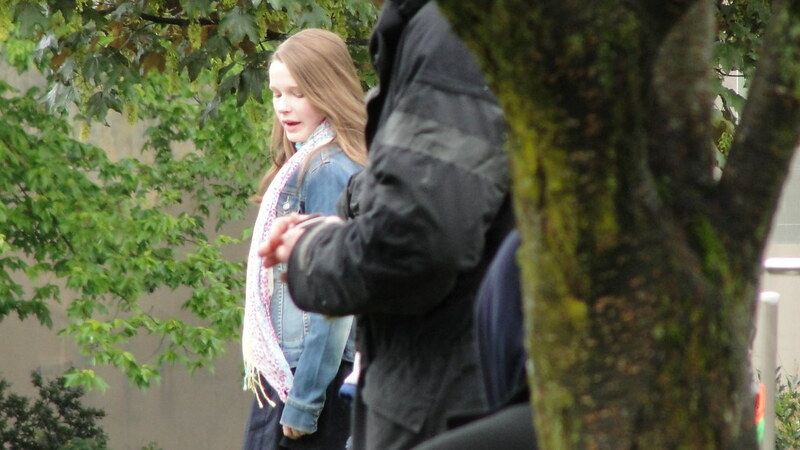 I think they started filming again at the beginning of April. It's not the most profound show on TV but it's fun, and I love seeing our hometown on display. It would be cool if the setting were actually supposed to be Portland, 'cause then there could be establishing shots over the Willamette and stuff. But even so, it's fun.